Regretfully, I did not post here over the past several months, despite having worked on some excellent projects during that period. My motivation has been flagging a bit due to personal issues. I am working to correct that, however, and perhaps by informing my readers (that's right - it's plural now!) of my progress I'll finally get something finished. This summer, I worked on a flash project with a good friend, intending to sell it on FlashGameLicense. We discovered the Video Game Name Generator (wonderful website, by the way), and after wading our way through the multitude of off-color names offered, we happened upon one that didn't sound vaguely sleazy and was somewhat comprehensible. Realizing that it was just a clever way of saying "submarine", we quickly drew together a plan for a underwater horizontal shooter. Thus, Little Battleship of the Deep was born. A battle with Liquid Man and his army of Vengeful Sewer Goldfish. Progress on Little Battleship was pretty slow, due to scheduling issues, but my friend and I managed to pull together something that resembled what we had originally envisioned. While it's not in a state where we can release a demo online, local testers so far have found it to be very entertaining. The art isn't final, the music isn't all there, and the bosses are incomplete, but despite all these obstacles, the game is playable. 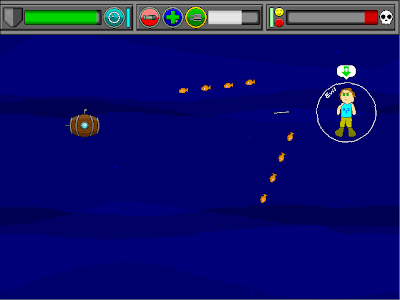 You can repair your ship, upgrade your equipment, choose bosses to fight, and eventually progress to the final battle. 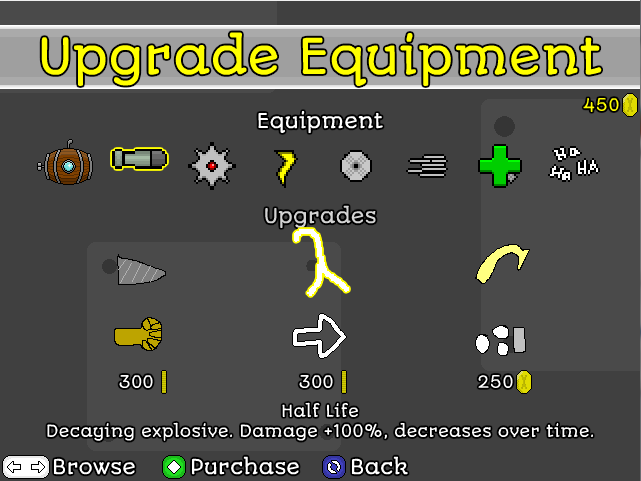 Behold - the upgrade screen. 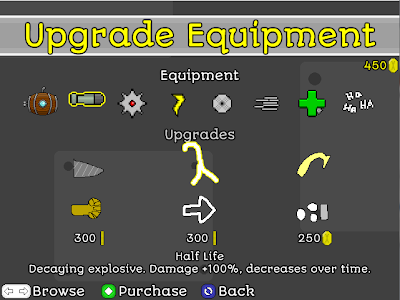 Of particular note is the upgrade system. Your ship and its seven weapons have three sets of upgrades, each being a choice between two mutually exclusive augmentations. We opted to veer away from the standard "Damage + 2" types of upgrades, preferring to modify play-styles over stats. Check out the game's page for more details. As far as personal events go, a few things happened in the past month. My appendix attempted to kill me, so I had it removed. That was a weird experience. My laptop overheated and subsequently refused to recognize my hard drive. Though I was able to recover my data, my laptop seemed to have met its end. Right before shipping it off to be repaired/hopefully replaced, the recovery disks that had been shipped from home, against all odds, managed to reinstall Windows on my laptop. It still performs about as well as it did beforehand, with all the power quirks and heating issues, but at least it performs. My Networking for Online Games class has challenged me like few before it. I've had to consider uncertainty, packet loss, simulating a shared environment, and many other factors, making programming and debugging my assignments time-consuming. I believe I'm past the most difficult parts, however; the technical aspects of networking have mostly been nailed down through a nice collection of C# classes. I look forward to finishing a polished, quality game for the course's final project. That's pretty much the extent of interesting events from the past several months. I'm thinking about putting together a short Twine story for Halloween. If any progress is made on that, I'll try to put together a post.